The American College of Greece is deeply grateful to S&B Minerals (recently acquired by IMERYS) and PHARMATHEN SA for their generosity in renovating the Chemistry and Biology labs (respectively) at PIERCE, which were revealed in a college-wide dedication ceremony April 21. Kicking off the dedication ceremony attended by ACG Trustees, faculty, staff, students and alumni, ACG President Dr David G. Horner thanked ACG Trustee Ulysses Kyriakopoulos, who as S&B Minerals Chairman, offered to renovate the Chemistry lab as a donation from S&B and the Kyriacopoulos family back in 2014, describing him as a “friend of ACG,” who was also one of the founders of ALBA in 1992, and started Junior Achievement in Greece in 2001, joining the ACG family when ALBA came on board in 2012 – among many other hats he has worn in his long and rich career. “The dedication of these two facilities is a happy occasion” Dr Horner added, that will not only benefit students studying science at PIERCE, but also at DEREE – and also provide research opportunities for faculty. He noted that 30 per cent of PIERCE students enter medicine, dentistry, and pharmacy, and spoke of DEREE’s science expansion and the collaboration between PIERCE and DEREE faculties and departments in planning the labs. Dr Horner also thanked members of the two families present at the dedication ceremony, including Nelly Katsou, Emmy Katsou (wife of Vassilis Katsos), Angeliki Katsou (mother of Nelly and Vassilis Katsos), Florika Kyriakopoulos, and Nicol Kyriacopoulos (Ulysses Kyriacopoulos’ wife). Among those present at the ceremony were ACG Trustees Vana Lavidas (DEREE ’79) – chairman of the Board of Directors at MDA Hellas – and Nikos M. Ebeoglou – executive Board Chairman of ALBA Graduate School, ACG faculty, staff and students, as well as PHARMATHEN scholarship recipient from PIERCE Myrto Mavrikiou and DEREE marketing student Maria Zotou Varouta, who interned with S&B in Philadelphia last year. Upon accepting his certificate of appreciation, ACG Trustee Ulysses Kyriacopoulos said that he was more than happy to initiate the renovation of the Chemistry lab, in order to turn it into as excellent a facilty as the rest of PIERCE. Following the speeches, Florika Kyriacopoulos (PIERCE ’72) unveiled the plaque at the newly-renovated Chemistry lab, named after S&B Minerals, where students demonstrated impressive experiments, and Nelly Katsou (PIERCE ‘83) unveiled the plaque at the newly-renovated Biology lab, named after PHARMATHEN SA, followed by a demonstration by PIERCE students. The impressive high-tech Chemistry and Biology labs will be used to teach science courses at PIERCE, while DEREE students studying environmental studies and biology will also be taught at the labs. DEREE student clubs and societies will also have use of the stellar labs. 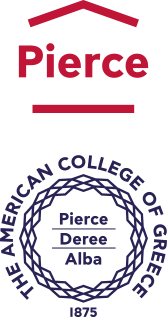 Faculty from both PIERCE and DEREE envision that the labs will also also be used to prepare for national and international competititions in the sciences.